With recent government regulations affecting the healthcare industry, healthcare practices have been impacted in numerous ways. Certain third-party health insurance payers have negotiated fee-for-service contracts with providers, which has resulted in lower reimbursement. HIPAA, the Healthcare Insurance Portability and Accountability Act has also had an impact, by tightening the requirements for claim data submission. And as the healthcare system transitions from a fee-for-service a value-based reimbursement model, healthcare practices and providers have had to adjust the way they bill for care provided. Due to these changes in government regulations, having a healthy revenue cycle is more important than ever. What is a Revenue Cycle? What exactly does the term “revenue cycle” mean? 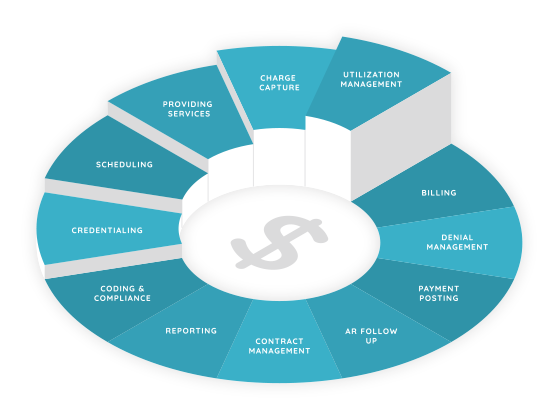 The revenue cycle is defined as all administrative and clinical functions that contribute to the capture, management, and collection of patient service revenue. In the most simplistic and basic terms, this is the entire life of a patient account from creation to payment. A healthy revenue cycle should follow billing and collection best practices to ensure bills are submitted in accordance with payor requirements and all services provided are billed. The last thing that a healthcare organization needs is to provide services and not be paid. Conduct Financial Clearance – This includes maintaining and verifying patient information before the patient arrives for their appointment. Insurance eligibility is checked and authorizations are tracked. Patients are notified of outstanding balances and prompt payment is encouraged. Streamlined Check-In & Check-Out Process – Patient information is confirmed and verified, eligibility determination is conducted; prior and new balances are collected. Charge Capture – An electronic charge capture process is utilized; specific coding situations are managed; documentation audits are performed. Charge Entry – During this phase, fee schedules are developed and managed; charges are entered; charges are reviewed and audited; the person responsible for editing charges is strictly controlled. Proper Claims Management – Electronic claims are submitted and status updates are frequent; secondary claim process happens; attention is paid to maintain compliance with insurance carrier’s claim format requirements; there are multi-tiered claim editing checks; assistance with edit tracking and error resolution happens; a system for easy rebilling or corrected claim processing is implemented; and an overall analysis of billing process delay times is taking place. Patient Statements – In the patient statements phase, cycled billing occurs; statements are clear and concise; there are notes and automated holds on patient statements when applicable; final notices go out. Payment & Denial Posting – This phase includes the entering of payments; the managing of contractual write-offs; the processing of insurance reversals; credit balance resolution; the review of denials and adjustments; and the control of who can edit payments. Insurance Follow Up – Verification that insurance carriers are receiving claims and that the claims are being processed; accounts receivable are worked on by priority; staff’s collection actions are audited; your practice’s average days in accounts receivable and net collection rates are known. Denial Management – During denial management, you’ll know if your claims denials rate is excessive; there is understanding of the claims denials received; your common denial causes are analyzed to improve processes; and denied claims are resubmitted if payment can still be collected. Patient Collections – During the patient collections phase, patient billing occurs; collection letters are sent; general collections take place; payment plans are offered; patient balances are reviewed before appointments; the productivity of collectors is analyzed. Payor Management – In this phase, attention is paid to fee schedules, carrier provider numbers and NPI, assignment of benefits, carrier communications and contract dates, documentation to support claims, and carrier analysis take place.